Home » Hiking » What are the Wilderness Survival Skills Needed to Survive on Your Own? 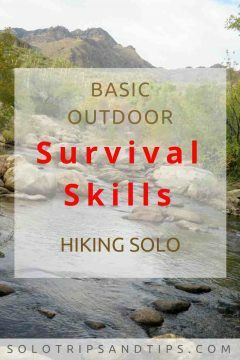 Today’s post Wilderness Survival Skills for Hiking Solo and Surviving Outdoors Alone will cover some of the basics for outdoor survival while hiking by yourself. 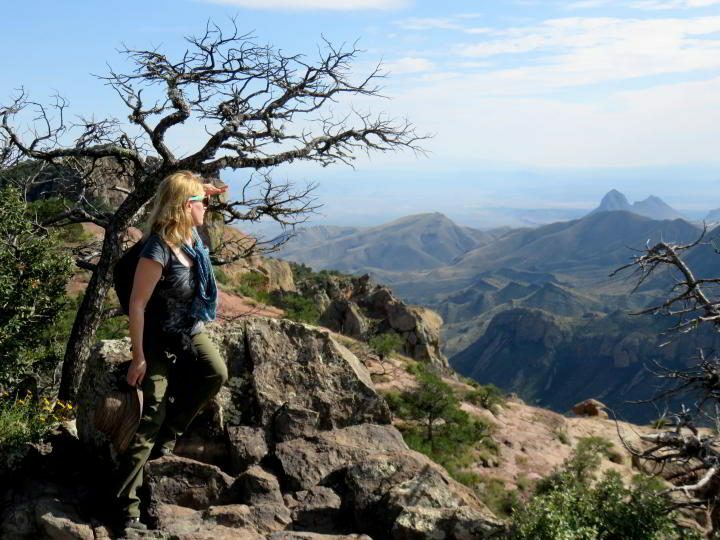 I have been hesitant to do any off-trail hiking alone due to lack of experience and knowledge. What if I got completely lost while hiking and needed to survive on my own? 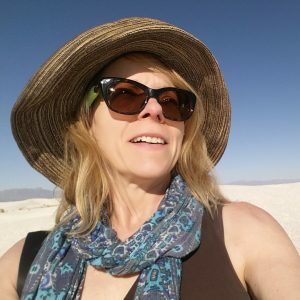 In an effort to increase my confidence and feel comfortable about hiking on my own, beyond day trips like my solo hikes at Big Bend, I am increasing my skills and knowledge base on the subject. I have taken a couple of classes with REI Outdoor School in Austin TX. Could I survive an emergency survival situation in the wilderness by myself? Previously, I attended the Backcountry Map and Compass Navigation class. I enjoyed the class and learned the basics of compass navigation and topographic map reading skills. Later I attended the class Wilderness Survival: 3 Season Skills and I want to share with you some of the key topics covered in the class. The class met at the Wild Basin Wilderness Preserve in Austin TX. I had driven by the sign along Highway 360 many times but had never been to the place. There are 2.5 miles of hiking trails at the preserve which is jointly owned by Travis County and St Edwards University. This is one of many hiking areas in Austin that help you escape the chaos of the city. Preparing for a hiking trip before you leave home is a key starting point. Make a check list of all the hiking gear, food, and essential clothing for your hiking trip. Find out if there is an entrance fee or permit required to the place you plan on hiking. Check the weather conditions as well as the trail conditions. Make sure someone knows your itinerary and what time you expect to be back. In bear country bring bear spray and know how to use it. What actions you take once you are in a survival situation will largely depend on how prepared you were for your hike in the first place. Hypothermia and hyperthermia could render you useless in just a few hours. Being prepared with proper clothing, ability to make a fire, and provide protection from the elements are essential to your survival. Hiking solo requires extra attention to preparedness not only with the gear you bring but also your emotional state and level of confidence in your skills. I am working on my survival skills for hiking solo now in order to increase my level of competence and ability to survive when things do not go as planned. Please bring bear spray, and know how to use it, if you are visiting bear country. It could save a life. On August 23 a 10-year old boy hiking with his family at Yellowstone was attacked by a grizzly bear. Fortunately the family brought bear spray and used it to save the child from a more serious or deadly attack. Air – People begin to suffer brain damage after being deprived of oxygen for 3 minutes. Shelter – Do you have adequate shelter available? What are the weather conditions? Water – How much water do you have with you? Where is the nearest water source? Do you have a means of purifying the water? Food – How much food do you have with you? What is your best source for food if your supplies run out? Get your bearings. Remain calm. Belly breathing will help bring you back to a calm state. Take a deep breath in through your nose and let your belly extend outward, then exhale very slowly through your nose or mouth. Repeat. Do some yoga or meditation for a few minutes if it will help you become calm and relaxed. What is your key to survival? What is your first, second, third priority? What gear and resources do you have? Will anyone be aware that you are missing? Your surroundings, weather conditions, terrain, availability of food and water, how many daylight hours you have. What is your top priority? Air, shelter, water, food. If all four are under control then signaling or finding your way back to familiar territory is your top priority. Start formulating a plan. Consider various scenarios and make backup plans. Put your plan into action. If shelter is your top priority assess how many daylight hours you have left and observe the weather situation. A rough estimate of hours of daylight remaining: hold your hand up to the horizon line and measure how many hands from the sun. Three hands or less start to prepare your shelter for the night. Keep assessing the situation. As conditions change you must change your plan if applicable. If your food or water is somehow eliminated without warning you need to plan your strategy around acquiring more food and water. On our hike with REI Outdoor school, our instructor brought a couple of samples of prickly pear cactus pads for a demo. 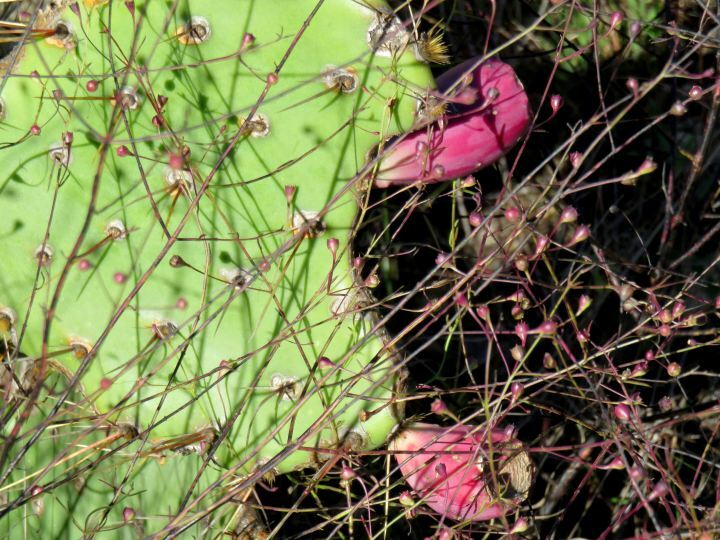 The fruit of the prickly pear cactus is also edible, providing a modest source of nutrients and much-needed liquid. To clean the prickly pear pads our instructor used a smooth, round rock and simply rubbed the surface of the cactus pad to remove all of the spikes. Once cleaned the cactus pads can be cooked over a fire. We were also shown how to make a vessel for holding water out of the pad. Clean the spikes off first then cut off the top portion of the cactus pad, about 1 inch from the top, with a sharp knife. Next slice into the opening, being careful not to cut through to the outside. Just keep cutting down into the pad and around the entire perimeter of the newly sliced top. Prop the cactus pad open with a stick and voilà you have a drinking vessel. We hiked to a stream to discuss the best sources for water and how to purify water. Running water is a better choice than sitting water and the more clear the better. If necessary you can sift away any silt using a bandana or other fabric. Filter using a water purifier purchased from a store – most people do not invest in a water purifier for basic hiking. I did buy a water purifier for my trip to SE Asia and used it exactly zero times. But if I needed it at least I did have it with me. The Lifestraw is something I bought recently, very affordable and lightweight, it gives me peace of mind to have this on my hiking trips. Dig a hole – this method was discussed as a last resort when no other means are available. Dig a hole a couple of feet from the water source and let the hole fill with water. The idea is that the earth will provide a means of filtering the water. Certainly not the best method but when in a desperate situation this could be the only method you have to filter the water. Hypothermia and hyperthermia are serious medical conditions that can cause death. Remember that just 3 hours without shelter in extreme conditions could be your death sentence. Weather conditions can shift dramatically with little warning and change an afternoon hike into an emergency survival situation. I always pack along an emergency Mylar thermal blanket in my day pack. It costs just a few dollars, weighs nothing, and could be a lifesaver. There are various types of emergency shelters that could be made from what nature provides – tree branches, leaves and brush, snow, or in tropical climates palm tree fronds might be used. If you are still on a trail the shelter should be located close to the trail with consideration given to water flow should there be a downpour. Protection from wind and precipitation is also desirable. Bring some type of rain jacket or rain poncho on your hiking trips. Building a fire is an essential emergency survival skill. Carry some waterproof matches and a fire starter striking tool as a backup. While on a junior-high school camping trip to Kananaskis Alberta I watched a demonstration on how to build a fire by rubbing two sticks together. It was cool but I would not want to rely on this as my chief fire starting method. If you are like me and have never been to prison, maybe you are unaware of the “prison lighter” technique for creating a fire from a bubble gum wrapper and a battery. I just learned about this during the Wilderness Survival class so I have not used it yet. I found a nice short video on YouTube to demonstrate this simple fire starter technique. Movement and contrast are the key elements that will help allow your signals for help to get noticed. Fire – build 3 fires in a triangle formation – several meters apart. One fire may not signal to anyone you are in distress but three separate fires will be noticed. If you find yourself in an emergency survival situation remember to consider risk mitigation when deciding what action to take. Before you start hiking solo, especially on longer excursions, gain some experience by going on group hikes and learn from people with more extensive hiking skills. Always bring the 10 essentials with you on every hike. I tore the meniscus in my left knee hiking alone in 1994. Has hurt ever since. I’d go with you, though! I follow Ellen and hire you as a guide! I found your tips fascinating though, but suppose you broke. a leg? And your mobile isn’t working? Take care Susan, where ever you go! Hi Wil, That is where signaling skills come in handy! And make sure someone knows where you went and your date of return – then they can report that you didn’t return and help can be sent to the correct general location. Proper gear and planning are most important as well. This is really great stuff! Thanks a ton.. This year two Dutch young women got lost on a hiking tour in South America. Months later their bones were found and the contents of a rucksack. We don’t know what exactly happened to them. Their family spent a lot of money and time trying to find them. I wish you all the best during all your travels. Most likely it was hypothermia or hyperthermia – 3 hours without shelter in extreme conditions can end a life. Tragic events like this happen each year. Best to plan in advance and be prepared – report your route to at least 2 people and give them maps of the route. The more prepared people are the less likely they are to end up in a survival situation. Survival during adverse condition can be challenging. Thanks for sharing useful information. Glad you found this post useful. Thank you for your comment. Wilderness survival is an important topic and a lot of people doing day hikes don’t think about the risks involved, weather changes or a simple injury could leave a hiker in an emergency survival situation.